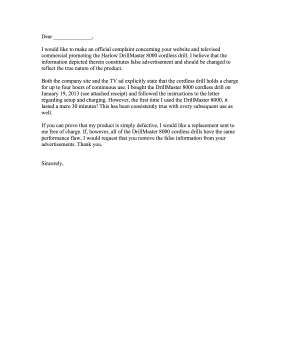 Great for misleading products or services, this complaint letter cites bad or false advertising. I would like to make an official complaint concerning your website and televised commercial promoting the Harlow DrillMaster 8000 cordless drill. I believe that the information depicted therein constitutes false advertisement and should be changed to reflect the true nature of the product. Both the company site and the TV ad explicitly state that the cordless drill holds a charge for up to four hours of continuous use. I bought the DrillMaster 8000 cordless drill on January 19, 2013 (see attached receipt) and followed the instructions to the letter regarding setup and charging. However, the first time I used the DrillMaster 8000, it lasted a mere 30 minutes! This has been consistently true with every subsequent use as well. If you can prove that my product is simply defective, I would like a replacement sent to me free of charge. If, however, all of the DrillMaster 8000 cordless drills have the same performance flaw, I would request that you remove the false information from your advertisements. Thank you.